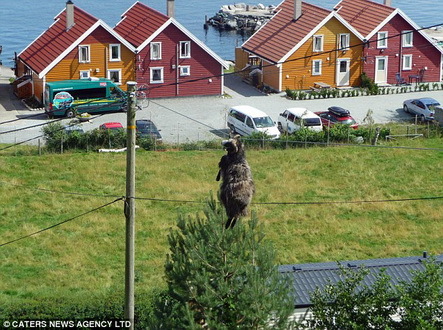 This hapless sheep has become a real life ‘ram-bo’ after inadvertently abseiling down a hill when its horn became snagged on an electricity wire. The unfortunate sheep was spotted bleating for help more than 15 feet above the ground next to an telegraph pole. Amazed onlookers watched the ram descend from a grazing pasture – apparently accidentally – while dangling from a live wire. Luckily he did not catch the current from the wire. 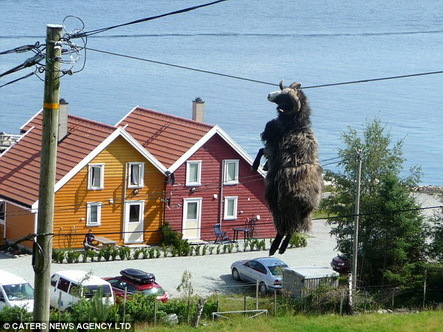 The drama unravelled at the small town of Helgoysund on the Norwegian coast on Wednesday. Tourists at the scene mounted a rescue attempt and eventually roped him to pull him back to ground level in little over an hour. Bemused spectators suggested he may have been trying to take the fast route down to a herd of ewes grazing in the field below. Marita Vestersjo Landsnes, aged 13, caught the calamity on her camera phone. 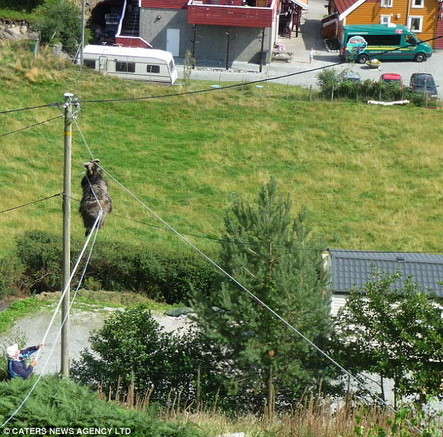 The schoolgirl said she couldn’t believe her eyes when she saw the sheep sliding down the live wire. Her dad Geir Landsnes, 45, also watched the dramatic events unfold. He said Marita would never to go out without a camera again. He said: ‘As a reward for his embarrassing predicament we helped him to achieve his quest by allowing him access to the ladies. ‘My wife saw something surreal from the kitchen window and realised it was the sheep hanging five to six metres off the ground from the wire by its horn and called me straight away, asking what to do. ‘I asked my daughter Marita to photograph the rescue operation so I could see the images of what had happened. The sheep had been grazing on the hill. He had got his horn stuck on the zip wire and as he got more agitated, was pulled down the hill on the wire he was attached to and ended more than up five metres above the ground. 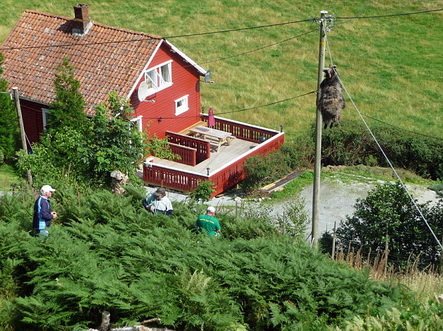 The German tourists were in the area because the Landsnes family, alongside the sheep farm, run a small vacation place on the Norwegian island. O MY GOSH…. IS THAT A WOUNDED BABY LLAMA?????? short circuit and the barbecue is ready!!! NOT FUNNY AND IT’S NOT A LLAMA.